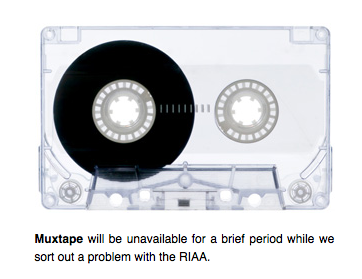 MuxTape, the website where people could make online mix tapes and purchase new music via itunes or amazon, is down and possible out. Looks like the RIAA scored another point. This should be no surprise since they’ve been very good so far at winning the game to destroy their own industry. God forbid I listen to music and discover new artists. Though maybe their problem was that the music I was finding was mostly not on major labels. Of course for me, this is a mixed bag. I liked MuxTape a lot. But I’d also love to see the music industry destroyed. Music needs to return to a place where it is no longer an industry. Then musicians can make a living and create great things and all the garbage that music execs throw at us can go spinning into oblivion.